Probably the most important news is that Oil was trading at $111.75 a barrel midday on Friday, the fifth full week it has been above $100. It remains at a level above 4% of GDP. Gas at the pump increased $.08 to $3.68 a gallon. Gasoline usage at 8853 M gallons was 2.5% lower than last year's 9057. This YoY comparison has turned negative and deteriorated further in the last week. The BLS reported that Initial jobless claims last week were 382,000. The 4 week average is 389,500. This is the seventh week in a row that this number has been initially reported below 400,000. On the other hand, this series has not made a new low in five weeks. Railfax was up 11.2% YoY, the best relative showing in months. Baseline traffic for the third week is no higher than last year's levels, intermodal traffic turned significantly higher last week, driving the improvement. Waste materials continued below last year's levels (this may be fallout from municipal funding cuts for recycling). Shipments of motor vehicles, however, continued to improve YoY. This was a good week. The Mortgage Bankers' Association reported a decrease of 6.7% in seasonally adjusted mortgage applications last week. This series has meandered generally in a flat range since last June. Refinancing decreased 6.7%, and is close toits lows since last July. The silver lining is that neither series has hit a new low in 9 months - the longest such period since the housing bust began half a decade ago. The American Staffing Association Index increased one point to 92, after stalling at he 90-91 level for 7 weeks. This is improvement for this year, but this series is making no relative headway against its pre-recession peak. The ICSC reported that same store sales for the week of April 2 rose 2.3% YoY, and increased 2.8% week over week. Shoppertrak reported an 8.7% YoY decline for the week ending April 2, and a WoW decline of 2.0%. Unlike almost every other series, these two series' YoY comparisons have been remaining steady or improving over the last month. Shoppertrak cautioned that calendar affects (Easter week this year vs. last year) strongly affected this week's result. The ICSC YoY result is about average for this year so far. Weekly BAA commercial bond rates increased.05% to 6.05%. This compares with a 09% increase in the yields of 10 year treasuries to 3.47%. Over the last 6 months both series have seen higher interest rates, but government bonds have generally been weaker. There is no sign of corporate distress here. Adjusting +1.07% due to the recent tax compromise, the Daily Treasury Statement showed that for this first 4 days in April, $41.9 B was collected vs. $35.5 B a year ago, for a gain of $6.4 B YoY. For the last 20 days, $155.8 B was collected vs. $138.3 B a year ago, for a gain of $17.5 B, or +12.6%. I suggest using this series with extra caution, because the adjustment for the withholding tax compromise is only a best guess, and may be significantly incorrect. M1 was up 0.7% w/w, up 0.5% M/M, and up a strong 10.0% YoY, so Real M1 is up 7.8%. M2 was unchanged w/w, up 0.1% M/M and up 4.5% YoY, so Real M2 is up 2.3%. Although Real M1 is still strongly in the "green zone" where it has been since before the end of the "great recession," Real M2 has been fading back into the "yellow zone" below 2.5%. Additionally, the weak +0.2% M/M reading means that, depending on inflation, it could become yet another of the 10 components of the LEI to go negative in March. This was a pretty decent week, but the continued slide in YoY comparisons of gasoline usage shows that Oil prices are taking a bite out of consumer spending. So far, only a slowdown and not a reversal in the economy seems to be in order. The above chart is from Ryan's economic projections, courtesy of Professor Krugman. 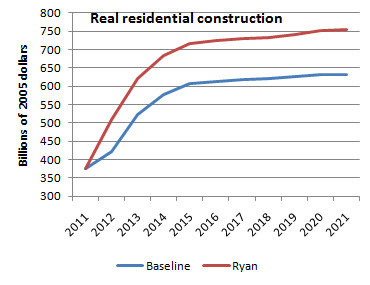 It assumes that under the Ryan plan, there will be a big increase in residential investment. There is a large inventory of homes on the market and that's before we get to the issue of foreclosed homes entering the inventory. In short, this is another example of magical think tank "thinking." As Mr. Mantega announced the controls, investors were surprised to hear him acknowledge that there are legitimate reasons for the real to rise. Some of the gains are "inevitable, because the real is a stronger currency, and the economy of Brazil is stronger than other economies, so there is an attraction and a security," Mr. Mantega told reporters in Brasilia on Wednesday as he announced an extension of a 6% tax on locals who borrow abroad—an effort to keep dollars out of Brazil. That is a big change from his confrontational statements of last September, when he warned currency traders that the government would draw on "unlimited resources" to buy dollars and keep the real from rising. "We will not lose this game," he said at the time. The real has gained 8.5% against the dollar since that Sept. 15 speech. Mr. Mantega declared that Brazil was in the cross hairs of a "currency war," where rich countries like the U.S. keep their currencies weak, artificially pumping up currencies in the developing world. The Brazilian real is rising as foreign money pours into the South American nation from investors optimistic about the country's growth prospects, as well as those hoping to cash in on its 11.75% overnight interest rates, among the world's highest. Those high interest rates have made Brazil a key global destination for the so-called carry trade, where investors borrow money in countries like the U.S., where rates are low, and deposit it in Brazil where rates are high, pocketing the difference. When Brazil used the phrase "global currency war" earlier this year, the blogsphere went ablaze, arguing that QEII was in fact a plot that would be the sole driver for higher commodity prices and lead to the ruin of developing countries. In fact, Brazil's currency was appreciating because it is growing, has high interest rates and numerous natural resources. In short, it is an attractive place to invest, inviting people to, well, invest there. Hence, the real reason for the Reals increase relative to other currencies. Now, a major Brazilian official is admitting as such. The multi-year chart shows the dollar in a clear consolidation pattern. On the top, prices are contained by a downward sloping line while prices on the bottom are contained by prices near the $22/level (which they have moved through). After a long-consolidation, the move lower will should be prolonged as traders have had some time to amass their respective positions. In the last year, notice the clear down/up/down or lower low, lower high pattern prices have moved in. The EMAs have also been providing upside resistance. Also note the 200 day EMA is moving lower, indicating the longer-term trend is down. The EMA/price picture is extremely bearish -- all the EMAs are moving lower, the shorter are below the longer and prices are below the EMAs. This is the most bearish orientation possible for a chart. Although the US economy is growing, which is usually bullish for a currency, there are other factors weighing negatively on the dollar. 1.) The large amount of debt the US is issuing is leading traders to question the longer term vitality of the US market (although the bond market is still printing very low interest rates, indicating they disagree with this for now). 2.) Other countries have must more attractive interest rate structures. The EU has just raised rates, as have other Asian countries. Australia was one of the first countries to start raising rates after the recession, and Brazil's rates are some of the highest in the world. In short, US rates are very low and therefore unattractive from a longer-term perspective. 3.) There are continuing signs of a possible slowdown in the US economy: durable goods orders are stalling and gas prices are very high. Right now, the dollar is in a confirmed downtrend. There is little reason to thing it will reverse course anytime soon, especially as the EU has started to raise rates before the Federal Reserve. Yesterday the economic blogsphere ganged up on the Heritage Foundation. I believe it started with Paul Krugman. I added my thoughts, and Invictus added his over at the Big Picture. In short, if the Heritage Foundation has any internal credibility left, it should issue an apology and move forward. However, this underlines a greater issue: the role of "think tanks" in public debate. First, I always place "think tanks" in quotation marks because these really aren't great organizations devoted to higher goals; they are groups of political hacks from both sides of the political aisle who are interested in pushing an agenda, and then twisting facts to move that agenda forward. Sometime over the last year, I was asked by a liberal "think tank" to participate in a "debate" regarding manufacturing policy. I foolishly participated. The other parties' initial response was a bit less than dignified, after which time it took them approximately 1-week to post my response. In short, I was asked to "participate" in order to be "one-upped" by their resident expert. Needless to say, I was less than thrilled by this treatment, but hopefully became wiser in the ways to politics. In short, both sides of the political aisle have their "experts" all of whom are essentially paid whores; give time enough money and they will say the sky is yellow, up is down, Kenny G is s great sax player, and the Cubs will win the Series this year. With March's payrolls number reported, let me update a few of the series showing how weekly initial jobless claims have been correlating with new job creation and leading the unemployment rate. Recall that the initial jobless claims rate has consistently led the unemployment rate for almost 50 years. In other words, the recent decline in iniital jobless claims is predicting further declines in the unemployment rate. Once again, initial jobless claims lead the unemployment rate. The relationship depicted here is a little more complex. The continuing decline in YoY iinitial jobless claims is predicting that the 6 month average of the unemployment rate will continue to decline YoY. This suggests that in the next several months, the October and November 9.4% and 9.8% unemployment readings will be replaced with significantly lower numbers, although not necessarily lower than March's 8.8% rate. The above relationships continue to indicate that the recent decline in the unemployment rate is no fluke. The validation of the leading relationship of the first graph above - i.e., the surprise drop in the unemployment rate - may be one of the big stories of 2011. The relationship continues to be close. Note that (1) job growth has occurred once the average of initial jobless claims dropped below 475,000; (2) recent job growth averaging over 150,000 a month with initial claims in the vicinity of 400,000 is no fluke; and finally (3) it appears that we only need to see initial claims drop to about 370,000 a month to give us the 300,000 monthly job growth we need to make a real dent in the 8 million long term job deficit caused by the great recession. Third, let's compare this job recovery with previous jobs recoveries. Net job creation is hires minus fires. Initial jobless claims generally tell us about the "firing" part of that metric. Conventional wisdom is, firing has declined sharply in this recovery, but "hiring" remains lackluster. In the below graphs, pay attention to how much firing was consistent with net payroll growth. Consider especially what that means for the "hiring" part of the payrolls equation. The two recoveries are tracking quite closely. Notice that in the 1975 recovery, 300,000 new jobs a month were created at the time when there were about 370,000 layoffs per week. If this recovery stays on the same track, we don't have far to go for some very good job creation numbers. In that recovery, there was some enormous new job creation. On net, 300,000 new jobs a month were being created at a time when there were still 450,000 layoffs per week. Both earlier recoveries were creating comparatively *fewer* new jobs than this one. Why? In this recovery we started on net adding jobs when there were about 475,000 new layoffs a week. In the 2003 recovery that didn't happen until there were only 400,000 layoffs a week, and in the 1993 recovery that didn't happen until there were only 440,000 layoffs a week. In other words, given the same amount of layoffs, there have been more *new* jobs created in this recovery than in either of the last two. This is strong evidence against the conventional wisdom that it is the lack of job creation that has been lagging in this jobs recovery. On the contrary, on a relative basis new job creation has been strong. It is the relentless continuation of elevated layoffs that has been the problem. On the multi-year chart, Gold is clearly in a bull market. First, there is a strong upward sloping trendline that started at the beginning of 2009 that is still intact. Along the way, prices have consolidated in dowward sloping pennant patterns, shaking out the weaker money. This chart uses weekly candles, so the EMAs are also weekly. Notice all are rising and the shorter are above the longer. In short, this is a very strong bull market. The daily chart shows that prices -- which had run into considerable resistance in the 140 area, have now convincingly moved through that area Note the strength of the candle that broke through. The EMA picture -- like the monthly chart -- is also very strong with all EMAs moving higher and the shorter above the longer. The primary technical indicators are giving a mixed reading. The A/D line has been stagnant since the fourth quarter of last year -- a reading that is confirmed by the weak CMF reading. Ideally, we'd like to see strong numbers confirming an uptrend. Over the same period of time, gold hit resistance in the 140 area, so the stalling could be a result of people taking stock of the fundamental situation. Also note the MACD dropped during this time. It has given a buy signal recently, but the overall pattern of the MACD is a bit weaker than we'd like. Gold is benefiting from several fundamental trends. All three of these events is powering golds upward move . While the technical indicators are a bit weak, the weakness can also be attributed to gold stalling/consolidating below 140. The multiple attempts to get through 140 have now resulted in a move higher. I know that many people have commented recently on the impact of the baby boomers on the labor force (and the participation rate), but I wanted to put attempt to quantify that impact. I drew upon Table A-6 from the Current Population Survey and the historical labor force statistics from the Current Population Survey for much of this data. I am going to look numerically at the labor force, but will also be drawing a few conclusions to the unemployment rate as well (this will be a graph free post). The baby boomer generation coupled with longer life expectancies have changed demographics (let alone economics) in this country profoundly in recent years and have skewed some of the metrics by which we measure economic health (and a recovery from recession). For instance, since 2007 over 1.5 million people age 65+ have left the labor force (whereas between 2003 and 2007 roughly 960k left of that same age cohort). This large nominal change in those leaving the labor force (and the growth in the general size of this age cohort) impacts the labor force participation rate as this age group has a much lower participation rate than those less than 65 (even though the rate for those 65+ is rising, it is still extremely low in comparison) and growth in their population as a percentage of total population will continue to place downward pressure on the labor force participation rate. Thus, even if the participation rate of those 65+ rises, the overall effect on the participation rate will be lower as the weight of the population 65+ increases. For the numbers, from the beginning of the recession until the most recently released data, demographic changes alone have accounted for taking roughly .3 off of the labor force participation rate. From 2003, those demographic changes have been responsible for roughly .57 points off the labor force participation rate (in other words, if we had the same age mix of the population we had in 2003, the labo0r force participation rate would be .57 points higher). While these numbers do no sound very big, they are huge in terms of changes to the participation rate, as the annual average for the rate in 2003 was 66.2 (today it is at 64.0), which means that roughly 26% of the drop in the participation rate from 2003 to today can be attributed to changing age demographics (obviously other factors come into play here as well since only 15% of the drop since the recession began can be attributed to those demographic changes). An inverse of this relationship occurs with the unemployment rate, as those 65+ typically have the lowest unemployment rate among all age cohorts (obviously since many are retired or could be and thus the percentage of those who need/want to work is much smaller). Thus, as this group's percentage of the population (and labor force, where it has risen from 3.9% to 4.6% just since mid-2008) increases, it will place some downward pressure on the unemployment rate (although at this point that difference is a relatively modest .02%). To sum all this up, the boomers will have a much bigger impact on the participation rate than they will on the unemployment rate, but they will have an impact on both and that impact will be increasing as more of that generation turns 65 (really 62 when they are first eligible for social security, but I haven't found a way to measure those 62-64 yet). The traditional concept most people have of recessions is businesses lay people off with the intention of hiring them back when the economy turns. However, this concept overlooks the possibility of job destruction -- that is, people were laid off from jobs that were subsequently destroyed, implying those laid-off won't be rehired. One of the reasons we are experiencing prolonged, high unemployment is the jobs from which people were laid-off aren't coming back. According to the above chart, employment reached its peak in January, 2007 when there were 137,998 jobs. In January 2010 there were 129,246 jobs, meaning the economy lost a total of 8,750,000 jobs during the recession. The above chart shows total construction jobs, which peaked in January 2007 at 7,718,000 and are currently at 5,514,000, for a total loss of 2,204,000 (the figure was slightly higher in January 2010, but not by much). Considering these jobs were created by a housing bubble that isn't coming back, its fair to say these jobs are at minimum highly questionable in their long-term viability. The above chart shows total manufacturing employment in the US. This figure was 13,728,000 in January of 2008, produced a reading of 11,465,000 in January of 20110 and currently stands at 11,667,000 for a loss of 2,061,000. Considering the increase we've seen in productivity gains over the last 25+ years, these jobs won't be coming back either. Simply looking at these two areas of job growth, we see that nearly 50% of the jobs lost are in areas where we can expect (at best) extremely paltry job growth. And this is before we factor in the professional jobs lost related to the housing market (mortgage brokers, realtors, architects, inspectors etc..). In short, a little more than a simple majority of jobs lost during the recession are in economic areas where we won't see any meaningful job growth going forward. This is not an endorsement of Mr. Ryans plan, as it has many problems which I believe are insurmountable -- the least of which is that $15,000 for private insurance for a person or couple aged 65 is not enough by far. I should also add that I fully advocate 100% public health care. The US is one of only three OECD countries that does not have fully funded public health care. At the same time, we pay far more than other countries, yet have a higher infant mortality and lower life expectancy. In short, we are clearly not getting what we are paying for. Except briefly during the Korean War, the United States has never achieved unemployment as low as Ryan and co. are claiming. The Fed believes that the lowest unemployment rate compatible with price stability is between 5 and 6 percent — that is, twice what Ryan is claiming he will achieve. What Krugman notes is the Heritage Foundation is projecting an unemployment rate of of 2.8% in 2021 (they are also arguing for an unemployment rate of, 6.4% next year, which is also highly doubtful, as I will argue later today). This is, well, laughable. But more to the point is how their analysis gets there. Their analysis assumes the following order of events: tax cuts lead to more investment, which expands the need to labor which increases hiring. Because workers face lower taxes, they have higher incomes, which increase spending (see page 3 in the report linked above). For those of you who are unfamiliar with this chain of thought, it's based on and around Say's Law. Say was a French economist who basically argued that supply creates its own demand. When business in operating, it has to pay labor (wages), lenders (interest) and producers of raw materials (which are converted into other products). All of this money going out from producers creates the income to purchase goods. However, notice one thing missing? Demand is never discussed. The theory assumes that business is simply stimulated to produce a good out of thin air. While it is important to talk about supply and the factors the effect supply, demand is just as important; if there is no demand for a good, there is no reason to produce it. By focusing their analysis on one side of the demand/side equation, the Heritage Foundation completely misses the economic boat. In the current environment, there is little reason to think a tax cut will lead to an increase in investment. First, capacity utilization is still very low, indicating there is currently excess capacity that business can access before adding more. Second, although consumers are spending, they are also saving more as well, indicating the demand side of the equation will be weaker. Third, China has been aggressively raising rates in hopes of slowing their economy. As China has been one of the primary drivers of the latest expansion, this does not bode well for the possibility of boosted US production. As I previously mentioned, Ryan does deserve credit for actually talking about the real problem facing the government: medical expenses. However, the more the details of his plan emerge, the more it becomes obvious he and his backers have engaged in pure economic magical thinking rather than a serious policy debate. For more, see this from Rex Nutting at Marketwatch. 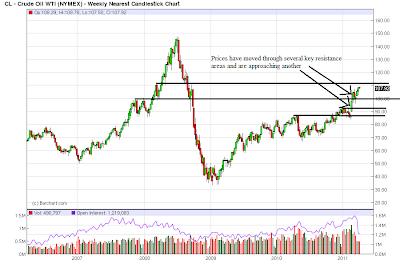 On the weekly chart, oil prices have moved through key resistance areas and are approaching a third. Note the length of time that prices were somewhat range bound between the 70-80 price area -- about 3/4 of a year. The longer the base, the stronger the rally from that base. Also note the strength of the move from the $90 price level -- prices printed a very strong bar. 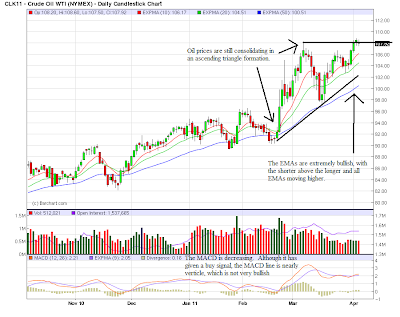 On the daily, chart, prices are still consolidating in a triangle pattern. While the EMAs are very bullish (the shorter are above the longer and all are moving higher) the MACD could be stronger. Also note the last two days have printed very weak candles -- candles with thin bodies, indicating a lack of intra-say price action. 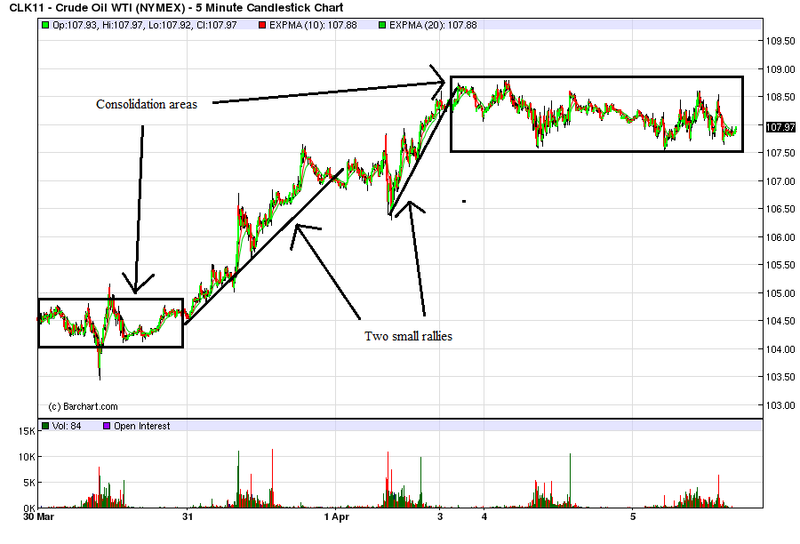 The 5-minute chart shows over the last five days a consolidation/rally/consolidation pattern. The 110/price level is important from two perspectives: it's a round number which the market likes and the level was hit over two years ago, providing technical resistance. In addition, its above the current resistance level of about 108 and should provide a nice "layover" in the event of an upward price move. However, on the fundamental side, there are problems for further price increases. 1.) There is evidence that increased oil prices are hurting overall US demand. 3.) There is talk of a possible resolution to the Libyan situation. While the third point is ephemeral, the first two go right to demand, indicating a slowing of demand is taking place, which may slow oil's price increase. This is confirmed by the weaker MACD reading. While I expect further price increases, I think the fundamental side of the equation will limit these increases for the time being. China raised interest rates for the fourth time since the end of the global financial crisis to restrain inflation and limit the risk of asset bubbles in the fastest-growing major economy. The benchmark one-year lending rate will increase to 6.31 percent from 6.06 percent, effective tomorrow, the People’s Bank of China said on its website at the end of a national holiday. The one-year deposit rate rises to 3.25 percent from 3 percent. China -- and to a lesser extent all the BRIC economics -- have been the drivers of this expansion. When the world's economies hit the wall, China engaged a massive stimulus program to prevent a slowdown which was largely successful. However, now the country is facing higher inflation, which they have attempted to limit by first increasing reserve requirements. However, those moves have not been enough; hence the more drastic action of starting to raise interest rates. Vietnam, Taiwan, India, South Korea and Thailand raised benchmark rates in March or April and Chinese officials have also drained cash from the economy by raising bank reserve requirements. As regular readers of this blog know, leaving aside the month over month variation, each quarter over the last 5 quarters, the average job gains have gotten better and better, to the point where, in the first 3 months of this year, more jobs were added to the economy than necessary to keep up with the growth in the labor force due to population increase. All of that is good, but as Dean Baker pointed out in a column over the weekend, even an average of 200,000 new jobs a month is not particularly strong compared with expansions over the last several decades. Each successive expansion has had progressively weaker job growth, and so far, this expansion is the weakest of all. For example, note that in the rebound from the 1974 oil shock, and in the early to mid 1980s, it was not uncommon at all for there to be job growth in excess of .10% or even .15% of population in a single month. In the last 10 years, that almost never happened. In today's terms, that would be 300,000 to 500,000 jobs a month. Note that the above list doesn't even adjust for population growth, so the actual comparison is even weaker. The bottom line is, we are getting some good job growth. But it's not good enough. By contrast, as I pointed out last week, the awful terrible soshulist New Deal generated in today's terms about 750,000 jobs a month for 3 years in a row. First, the deleveraging of the household sector is rather well advanced and continuing. Households are repairing their balance sheets by reducing debt and rebuilding savings. The savings rate has hovered around 6 percent for many months now, more than triple the level that prevailed at the end of the Great Moderation. Consumer spending has been growing more slowly relative to income than it did before the recession. I expect that this more measured consumption behavior is likely to persist. A less consumption-dependent economy will help rebalance the country's external accounts—the trade and current accounts. It's unlikely and even undesirable that there be a drastic shift away from consumption, so less American consumption will not fix the global imbalances. But a stronger savings and investment economy here and its mirror image—a less consumption-driven economy—should temper the dangerous tensions that are characteristic of international imbalances. Stronger savings by U.S. consumers won't be enough to correct our external imbalance without significant reduction of the country's public borrowing. NDD and I have both commented on the above phonomina; I did so here and NDD here. The chart above is a long-term (4+ year chart) and shows that Treasuries have been rallying for the better part of four years. This period covers the contraction caused by the recession when Treasuries were the beneficiary of the safety bid and the first part of the current expansion. However, with more and more talk of the Fed at minimum getting out to QEII, Treasuries are less attractive, explaining recent selling pressure. 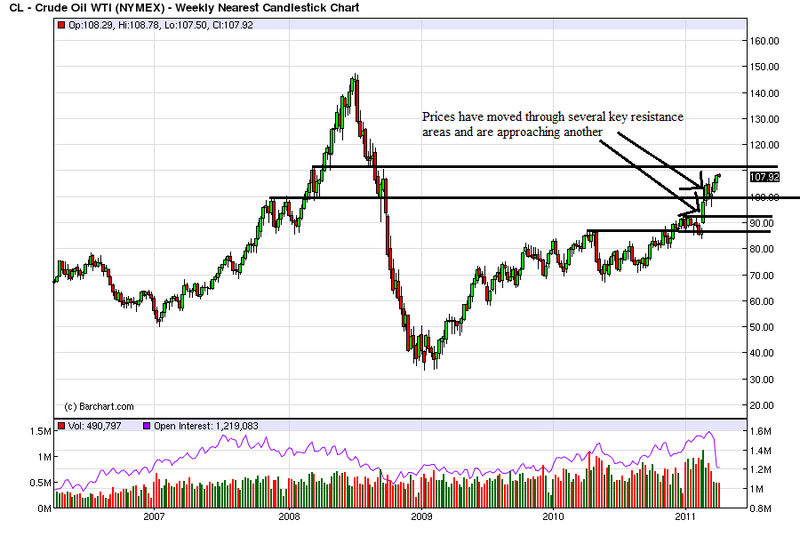 Notice that Treasury prices (weekly bars) are currently right at 50% Fibonacci levels. In the last week, we've seen Treasury prices sell-off hard, moving through resistance and continuing in their downward sloping pennant pattern. For a period, Treasury prices were experiencing their longest down period since 1999. While Treasuries caught a safety bid due to Middle East tensions, the sell-off indicates traders are losing their fear. In addition, as it becomes more and more obvious that the Fed is leaving the market, traders are seeing the exit of a very large bid, adding further downward pressure in the market. Going forward, I would expect Treasuries to retest the 200 day EMA, perhaps move a touch higher, but then resume their downward trend. The Fed is getting out of the market and the economic numbers on balance are indicating the recovery is self-sustaining (although possibly slowing down). In addition, we have heard more hawkishness from the Fed of late. Every now and then I do a google search to see who if anyone has picked up on Bonddad's or my posts. Recently I have discovered that there is another person who goes by the handle "New Deal Democrat" posting at yahoo message boards and some other places. That wouldn't be such a big deal, except it turns out this person is a climate change denier and a racist, and some people are responding to him as "NDD." So, for the record, if you come across a post that uses this handle, and it doesn't sound like me and the person is espousing opinions you wouldn't expect me to have, that's because it isn't me. The next chapter: whither the Expansion? I've been blogging now for about 6 years. The first chapter of my blogging involved documenting the turn from housing bubble to housing bust in real time, while positing that the economy was "not Doomed yet." By the end of 2006, when the yield curve inverted, it was apparent that we had become Doomed and that some type of replay of the 1929 scenario was likely. Even so, to paraphrase Mark Twain, "history may rhyme, but it doesn't repeat." Thus when the crash came I focused on whether it would turn into a deflationary spiral, or would hit bottom without the worst happening. 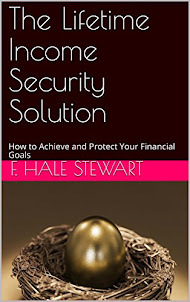 By about April 2009, it was apparent that the economy would most likely bottom in about the summer, and that the worst case scenario had been averted. As most readers of this blog know, this last assertion cut against some deeply entrenched ideological beliefs. Once we had a 1929 style crash, Doomers thought, there must be an inevitable slide into full-on depression, with 25% U3 unemployment and ever worsening conditions for the vast majority of people. Thus, for the last two years, almost all of my blogging energy has been put into documenting that history did NOT in fact repeat. The economy bottomed, real income bottomed, industrial production bottomed, consumer spending bottomed, the unemployment rate bottomed, and finally the number of people holding jobs bottomed. Every single one of those measures of the economy has been up for at least one year, or even close to two. With the exception of employment and unemployment, almost every other metric (including real income) has regained at least half the ground lost during the Great Recession. I am officially closing that portion of my blogging career. Although the Pied Piper of Doom and his acolyte Doomettes continue to glory in their ignorance (last week he demonstrated that he does not know how mortgage insurance works, nor how the FDIC collects its assessments), as far as I am concerned, you can stick a fork in them. They're done. Even Mish (remember the L-shaped recovery and the state tax revenues that weren't increasing?) and David Rosenberg ("The End of the End of the Recession") have thrown in the towel, although they just can't help being bearish. The Recovery is trying its best to turn into a self-sustaining Expansion, Oil and world events be damned. In other words, it is time to open a new chapter. What does the expansion look like? What are its defining features? What are the biggest threats to continued improvements? So far, the quintessential feature of the Expansion has been the powerhouse recovery in manufacturing and exports. Month after month, the ISM and the Chicago PMI, among other measures, show the strongest expansion in manufacturing in decades. Much of that is going overseas in exports. This growth is responsible for a large share of the V-shaped recovery in the GDP and in Industrial Production. At the same time, fewer and fewer employees are needed to manufacture items, which are increasingly assembled via machines and robots. Another hallmark of this expansion has been the continued deleveraging by households, generating hundreds of billions of dollars in savings which are gradually being unleashed into consumer spending. Real retail sales continue to grow at a rate in excess of 5% a year, equal to the highest rate of growth during the last expansion - but without the toxic byproduct of debt. On the other hand, that a vast chasm of inequality has opened in society, that it is being exacerbated by an increasing share of inherited wealth and increasing lack of social mobility, and that neither large political party shows any interest in addressing the problem, means that even though corporate America is enjoying record profits, none of the real improvement is filtering down to average workers. Real median wages have made no progress whatsoever since the end of the recession. The expansion moves faster or slower, depending on whether workers temporarily have more real disposable income or less. There is no sign of that changing. Nor will it change until there is a change of mindset within the Beltway. The odds are, that change in mindset will have to come from outside the current power structure of the two existing political parties. The biggest threat to the ongoing expansion in the next several years is probably Oil. Whether or not "peak oil" has occurred on a global basis, it is clear that the supply-demand balance is tight. Economic growth leads to increased demand for Oil, as to which there is very little excess supply, resulting in a near-vertical price spike. We had a mini-spike last spring, and we are having a bigger spike now. A big enough spike will cause the economy to sink back into a recession. Against this are new finds off the coast of Africa and Brazil, new technologies opening up the shales of North Dakota, the vast increase in natural gas production, and continuing efforts by automakers to increase fuel efficiency including conversion away from gasoline entirely. At some point all of those together will reach critical mass and bring an end to this era of the choke collar hold of Oil on economic recovery. Another brake on the expansion, that bears signs of watching as to bottoming, is construction. New home sales are bouncing along the bottom, and nonresidential construction continues to decline, albeit at a slower pace. The bust in housing prices will bottom just as it topped, one metropolitan area at a time. As I pointed out the other day, in at least one such area - southwestern Florida - the bottom may already be in. An even bigger, but less immediate threat is the fact that the imbalance of power between the financial class and the rest of society remains completely unaddressed. Nothing of significance has been done to rein in risk-taking by now even bigger Too Big to Fail institutions. All of the same poorly aligned incentives are still in place. Unless there is a fundamental change, eventually there will be a Great Recession 2.0 - and it is extremely unlikely that the public will tolerate 2008-style bailouts for a second time. Even if the next recession should hold off for another seven or eight years, we need an average of something like 250,000 new jobs a month to be created during that entire time for all of 8 million plus laid off during the Great Recession to find employment before that time. Yet so far we are on track to as paltry a job-creation record during this expansion as during the last one. We need a modern sports sedan of a fiscal policy, but Beltway Washington is instead reverting to the high collars of the horse and buggy era. That the Doomers have been shown to be relentlessly wrong does not mean that the Obama Administration and Congress have done enough. Republicans will present this week a 2012 budget proposal that would cut more than $4 trillion from federal spending projected over the next decade and transform the Medicare health program for the elderly, a move that will dramatically reshape the budget debate in Washington. The plan would essentially end Medicare, which now pays most of the health-care bills for 48 million elderly and disabled Americans, as a program that directly pays those bills. Mr. Ryan and other conservatives say this is necessary because of the program's soaring costs. Medicare cost $396.5 billion in 2010 and is projected to rise to $502.8 billion in 2016. At that pace, spending on the program would have doubled between 2002 and 2016. Mr. Ryan's proposal would apply to those currently under the age of 55, and for those Americans would convert Medicare into a "premium support" system. Participants from that group would choose from an array of private insurance plans when they reach 65 and become eligible, and the government would pay about the first $15,000 in premiums. Those who are poorer or less healthy would receive bigger payments than others. However, Mr. Ryan deserves credit for actually dealing with the primary problem -- health care expenditures. While I believe his solution is incorrect, he is attacking the correct problem. The rally over the last week or so has been very weak. 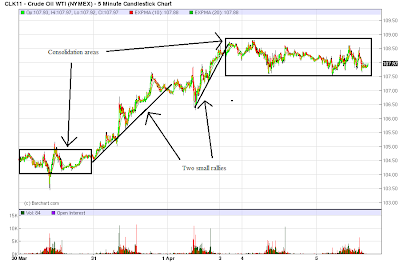 Volume has been down and half of the upward moves occurred at the open with no intra-day follow through. The SPYs are still contained by a downward sloping trend line. However, the IWMs (which have led the market higher) have broken through their trend line but also have a declining MACD. While the underlying technical are still OK (for example, the MACD is about to give a buy signal on the SPY) the underlying economic situation (weakening durable goods orders, high gasoline prices, increasing agricultural prices) are concerning. The weakness of the rally continued last week. The intra-day, 5-minute chart shows there was only one day (Tuesday) when the market rallied throughout the day. Two days (Monday and Friday) saw an end of the day sell-off and the big upward move (the jump between Tuesday and Wednesday) was followed by two days of sideways movement. Ideally, we'd like to see prices make a consistent move higher, supported by an upward sloping trendline. 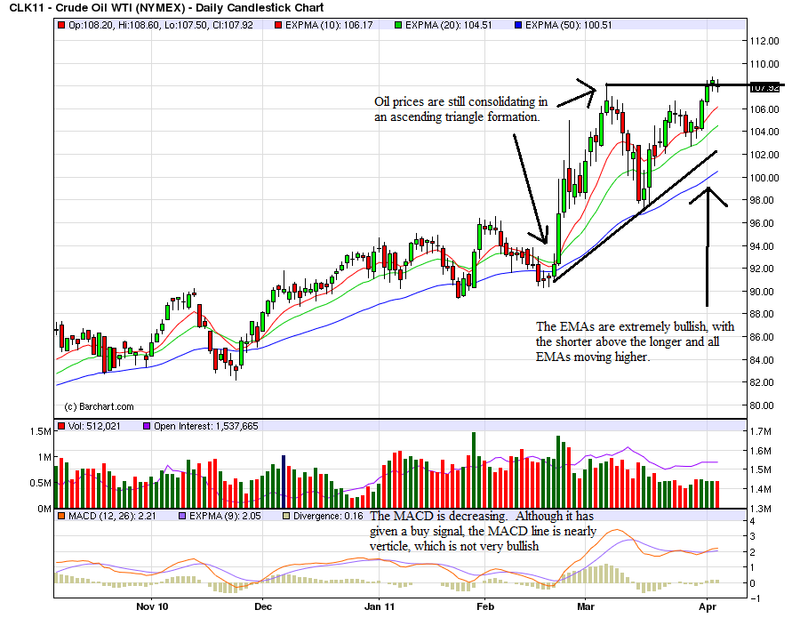 The above chart shows no consistent move higher. Notice that prices are below two important resistance areas. While the IWMs and IYTs (transports) have broken out, the QQQs have not. In addition, the weak volume is very concerning, indicating there is simply a lack of participation in the market. 1.) There are signs of an economic slowdown. Durable goods orders are stalling -- they haven't dropped but also haven't risen as sharply as we would like. Gas prices are at 3.59/gallon nationally, which is very high (also note we're right at the beginning of the summer driving season when gas prices typically increase). Unemployment -- while dropping a full percentage point over the last four months -- is still at 8.8%. The fall out from the Japanese earthquake is disrupting supply schedules in the auto industry. Savings and paying down debt is the order of the day, indicating consumers could start to pull back on spending. Domestically, it seems as though people are in a "show me the money" phase of the recovery. China is trying to slow inflationary pressures with more severe bank measures and we're still hearing about possible problems in Europe. Brazil -- which still has high interest rateds -- recently raised rates to slow inflation. International economies have led us out of recession -- now there are signs their growth is slowing. The A/D and CMF are both showing very weak readings. The last time they showed similar readings was in May of last year when prices moved sideways as Europe dealt with its debt issue. While the MACD has given a but signal, it would be far better if the other indicators confirmed this trend, which they're not. In short, the technical picture is weaker, but not catastrophic. In addition, prices are up 104% from their ultimate low in 2009, so a breather is in order.